CHANDIGARH, JANUARY 30: The Punjab Governor and Administrator, UT, Chandigarh, Shri V.P. 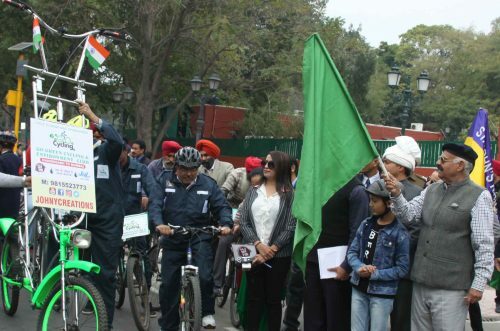 Singh Badnore today flagged off a cycle expedition organized by the Go Green Cycling & Environment Club from Punjab Raj Bhavan Chandigarh to Mumbai covering 5100 + kms long journey. According to Mr. Rajiv Kumar riding a.8.6 ft Tall cycle adjustable upto 10.6 ft the main aim of this cycling expedition apart from promoting cycling for healthy living is to save the day by day deteriorating environment. A 13 year old Shaurya S. Sharma a student of St. Johns school Chandigarh is also accompanying the expedition. The Club has created History when a Cycling Contingent participated in the Republic Day Parade for the first time in the History of Independent India. The journey is dedicated to the memory of Late Sh. Rajeev Sagar Sharma, IPS of 1977 Batch Haryana Cadre & Founder Member of this organization. He was a student of St. John’s High School passed out in 1971 Batch. He was a member of SJOBA. He was himself a cycling Enthusiast.